In the nearby Dinosaur attraction, you use a time rover to head back to the Cretaceous period to bring back an iguanadon. But on this trail, you see the real deal. Living species from the time of dinosaurs. 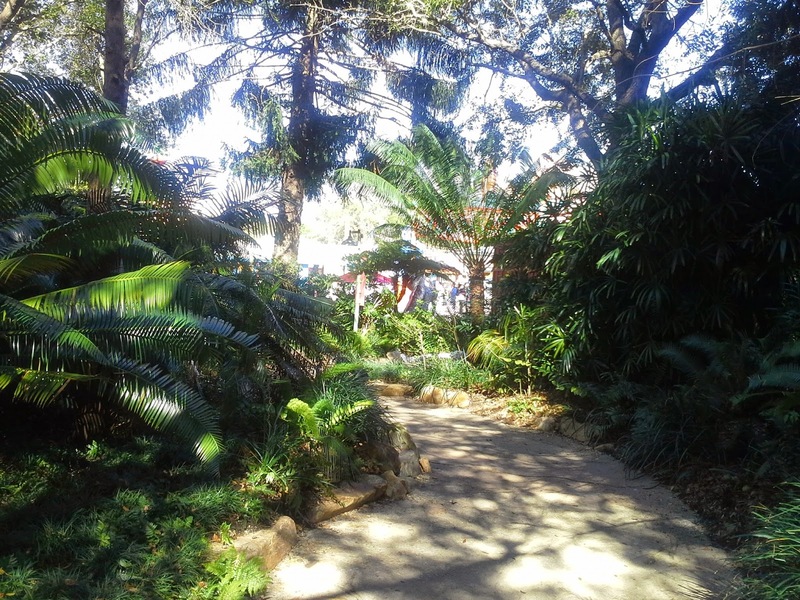 This path is tucked away, near both the exhibit of Abdim's storks and the path to Dino Institute. In fact, it is the Institute who sponsors this trail. Take a look at the sign above and you can see their logo on the bottom. Here they want their visitor to experience some of the life that existed along with their studied animals, the dinosaurs so they have created this botanical garden. The entrance is protected by a dino statue. 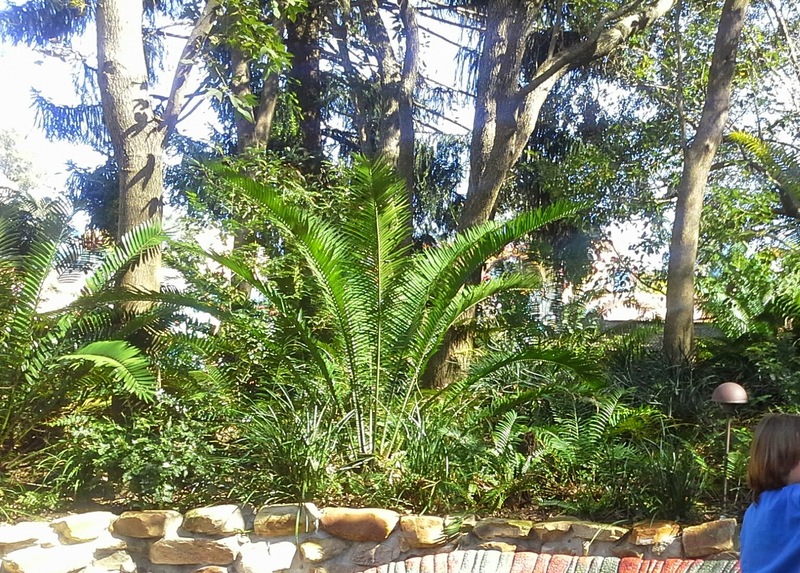 Behind it is a beautiful example of a cycad, a plant that thrived during the time of the dinosaurs and still does well today. In fact, the Dino Institute has one of the largest collections of the plant in North America. The cycads are palm-like plants that are called gymnosperms. The name means "naked seeds" and refers to the fact that they don't use fruits or flowers to protect their seeds. Although they nearly went extinct thanks to the ice age, they can now again be found nearly everywhere. Other ancient plants like monkey puzzle trees and ginkgo biloba are also found in this space. Another highlight of the trail is this guy, the Pachycephalosaurus.Unfortunately, in recent months, Donald has had a meet and greet back here which honestly can kill the peaceful ambiance of the place. Turn a corner and there is usually no one around. The trail goes back fairly far and most guests don't bother with it. But there are benches and plenty of shade. Hidden back there are even more dinosaur statues as well as recordings of the sounds of an ancient forest. The Cretaceous trail is certainly nothing fancy. Its just one of the great spots at the park that provides sanctuary and the feeling of being elsewhere. Great article. I think this is probably my favorite trail in the park, displaying amazing sculptures amidst some great, accurate landscaping. The lounging dinosaur is actually an Upper Cretaceous (Campanian epoch) hadrosaurid of the genus Corythosaurus (Thou whether it is C. casuarius or C. intermedius I cannot identify). Pachycephalosaurus is a pachycephalosaurid and actually lived almost ten million years later (Maastrictian epoch). However, it is easy to understand where the misunderstanding is, seeing as both having large growths on their skulls, both most likely used for social/sexual display. Anyways, greath job and I look forward to the next Dinoland article!